I rise from my sick bed to pass along two things and say one thing. Signaling he's decided on new troop levels for the Afghanistan war, President Barack Obama said Tuesday he intends to "finish the job" on his watch and destroy terrorist networks in the region. The president said he would reveal his decision on how many additional soldiers to deploy to Afghanistan after Thanksgiving. The White House is aiming for an announcement by Obama either Tuesday or Wednesday in a national address. Congressional hearings will quickly follow. Military officials and others have been expecting Obama to settle on a middle-ground option that would deploy an eventual 32,000 to 35,000 U.S. forces to the 8-year-old conflict. That rough figure has stood as the most likely option since before Obama's war council meeting earlier this month when he tasked military planners with rearranging the timing and makeup of some of the deployments. That led to Monday night's final gathering. With the war worsening on Obama's watch, U.S. combat deaths climbing and public support dropping, the president seemed aware he has a lot to explain to the public. "I feel very confident that when the American people hear a clear rationale for what we're doing there and how we intend to achieve our goals, that they will be supportive," he said, speaking at a White House news conference with Indian Prime Minister Manmohan Singh. "It is my intention to finish the job," he said of the war in Afghanistan that has been going on since shortly after the Sept. 11 attacks in 2001. Obama held his 10th and final war council meeting Monday night. In response to a question about his upcoming announcement, he sketched out the areas - but not the specifics - of what he will talk about after Thanksgiving. NO, OBAMA isn't LBJ, and Afghanistan isn't Vietnam, but I watched Moyers' broadcast -- I highly recommend you watch the whole thing, either above or on the PBS web site -- and those "echoes and refrains" do not only "resonate" today, they are absolutely eerie. Afghanistan is every bit the mess today that South Vietnam was in 1964, with the added complication that the Afghans have been forever ungovernable. The French empire, in tatters after World War II, was finished off in Vietnam and Algeria. The Soviet empire died, in large part, in Afghanistan. And if Barack Obama -- who has debunked any hope Americans had in him as a transformative leader -- either cannot or will not learn the lessons of history, the American empire will be finished off in the Middle East, and maybe America with it. 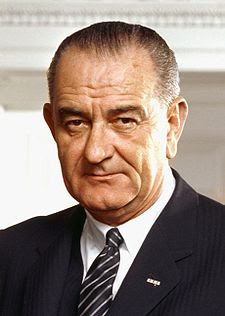 President Johnson led a country with a strong economy and a manageable deficit. All Vietnam cost him was the Great Society . . . and 58,000 American lives sacrificed for absolutely no damn good reason. President Obama leads a country brought to its economic knees, with no hope of standing tall anytime soon. All Afghanistan might cost him is everything . . . and God only knows how many American lives sacrificed for absolutely no damn good reason. THERE IS the mission of killing as many al Qaida as possible, which is doable. That was the original reason for going into Afghanistan -- not getting ourselves caught up in the sequel to Brezhnev's Folly. Capturing and holding the entirety of Afghanistan is not doable. Neither is creating a relatively honest, Western-style democratic government there, nor is turning 12th century peasants into postmodern, pro-Western sophisticates capable of supporting a relatively honest, Western-style democratic government. Hubris has been the death of many an empire whose time has past. We are a hubristic people. Labels: Afghanistan, Barack Obama, decline and fall, government, Lyndon Johnson, politics, War on Terror, Washington D.C.
Is all right . . . is all right. . . . Here's $8 million. Please go away. And you don't think Omaha's warped? I say, I say, I say. . . . Remain calm, oil is well. . . .
See, I have this antique juicer. . . .
Oh, they built the ship Titanic. . . .